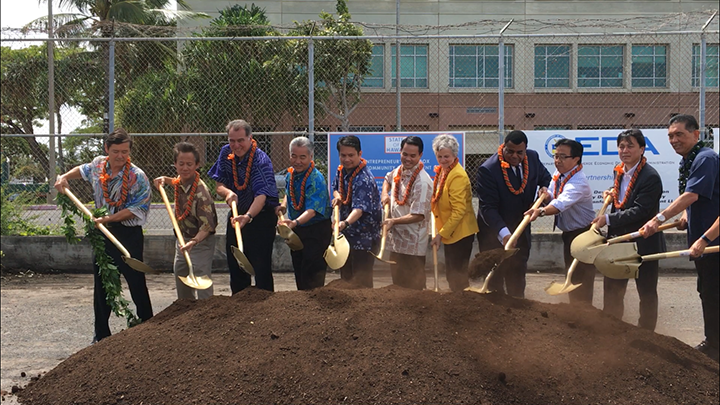 HONOLULU—A groundbreaking ceremony today marked the start of construction on the Hawaii Technology Development Corporation’s (HTDC) Entrepreneurs’ Sandbox facility in Kakaako. When completed, the facility will be an innovation center where everyone from keiki to kupuna can bring their ideas to life and learn to build products and develop creative media. The two-story, 13,500-square-foot Sandbox is expected to be completed in 2019 and is the first phase of the Kakaako Innovation Block. The flexible nature of the building, open architecture, and central location allow for a constant flow of people and new ideas that foster innovation. The Sandbox is a public-private partnership, three years in the making. Its purpose is to provide a new generation of entrepreneurs the tools, programs, and environment to start and grow their business, which will help diversify the state’s economy. The Sandbox will be equipped with ultra-high-speed internet connectivity. The innovation center will also target the startup community’s fundamental needs: attract and recruit new business, encourage growth and diversification, help entrepreneurs in their business development efforts, promote a business-friendly economic climate, and increase the availability of high-wage jobs for Oahu. “We are honored to oversee this exciting project in collaboration with HCDA and HTDC in creating an entrepreneurial center for innovation and technology,” said Stanford Carr, president and founder of Stanford Carr Development, a private sector partner in the project. Future phases of the proposed Kakaako Innovation Block include a 150,000-square-foot building dubbed the “Innovation Hale” for commercial tech businesses, 140,000 square feet of space for higher education, 47,000 square feet of startup business incubation space, a 900-stall parking structure and a public plaza.